My good friends Whitney and John recently welcomed their baby girl Tyler Elizabeth into the world. 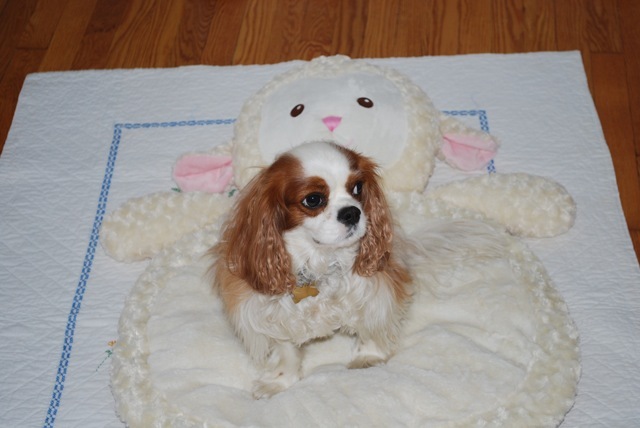 They were concerned about the reaction of their first child--Brighton, a four-year-old Cavalier King Charles Spaniel. In order to get Brighton comfortable with the drastic changes in the household that usually accompany a new baby, we started working on a few things well before Whitney’s due date. Our goal was to anticipate the changes the new baby would make to Brighton’s schedule, and then start introducing those changes five or six months before the baby was due. That way, Brighton would have plenty of time to get accustomed to his new routine, and there wouldn’t be so much to adjust to once Tyler arrived on the scene. Brighton's owners set up a schedule that they hoped to maintain once baby Tyler arrived. Each day included at least ten minutes of uninterrupted "Brighton time" that would happen no matter what was going on with the baby. Another key technique was to take the empty baby stroller along on Brighton’s walks. This allowed the dog to get used to the strange new contraption. It was also a chance to practice loose-leash walking techniques so Brighton wouldn't pull while on leash. 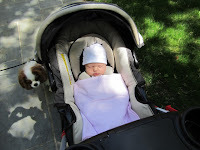 Making sure that Brighton would behave well on walks with the baby meant that he could be included in as many future family outings as possible. Whitney created a beautiful nursery in preparation for baby Tyler. She and John always left the nursery door open so Brighton could explore the area and get used to the unfamiliar smells of baby powder and diapers. Though he was encouraged to investigate, Brighton was never allowed to sleep on any of the baby's furniture or belongings, because these would be off-limits once Tyler was home. Once Tyler was born but still in the hospital with her mom, John brought home some of the clothes the baby had worn and left these around the house for Brighton to smell. This gave Brighton a chance to get acquainted with all the smells of a newborn baby, so he wouldn’t besurprised when Tyler came home. When Whitney and Tyler were released from the hospital, John waited outside their home with the baby while Whitney went in to greet Brighton. Once Brighton calmed down from the excitement of not seeing Whitney for three days, John and Whitney set up a formal meeting of baby and dog. Whitney sat on the couch with Tyler, and John brought Brighton in on a leash. Whitney and John praised and petted Brighton while he approached and sniffed Tyler. Whitney and John are lucky: since Brighton is an exceptionally well-behaved and sweet dog, he accepted his new sister without missing a beat. But not all dogs are as laid-back as Brighton. If a dog shows any signs of aggression, excitement or excessive interest in a baby, the dog should be kept on a leash at all times when the baby is present. When only one adult is home, the dog should be kept in a separate room, without any access to the baby. Remember that even a non-aggressive dog may become overly exuberant and cause injury by jumping up on a baby. A new baby is a big change in any household, but with thoughtful planning the transition can be made as smooth as possible for your furry family members.